On Tuesday, 2016 WR target Simi Fehoko released his Top 5 schools via Twitter and as expected, Michigan made the cut for the talented receiver. Simi is a new name to the Michigan recruiting board, as he was offered a scholarship of March 3rd. After watching his film, it’s easy to get excited about what Simi brings to the field. He can lineup at the standard wide receiver position on the sidelines and use his speed to blow past defenders, or can lineup on the inside and use his stout route running ability to get open. Has good size (6’3- 195), that should translate well to the college level. Has a solid burst off the line of scrimmage and above average straight line speed. One aspect of his game that I’m a big fan of is his ability to gain additional yards after the catch. With his speed, Simi is constantly blowing by cornerbacks/safeties and once the ball is in his hands, he plays very elusive. Has a knack of constantly finding open space in the defensive secondary. Simi does an excellent job of high pointing the ball and catching it with both hands. On shorter routes, he is able to get open due to his quick feet. All in all, Simi is a very good looking recruit who looks as if he could be a useful weapon at the collegiate level. While Utah is not exactly a “hotbed” for recruiting, Michigan has had some success landing commitments from recruits in the Bee Hive State (Houma, Mone). At this point in his recruitment, I would guess that Stanford is the front runner to land his services, but if Simi is able to visit Ann Arbor later this year, Michigan could find themselves in a good position going forward. Simi is currently ranked as a three star recruit and the #1 recruit in the state of Utah according to Rivals. He holds scholarship offers from mostly West Coast schools such as; BYU, Utah, Washington, Arizona State, Oregon State, Utah State, and Washington State. As a junior, Simi had 1,644 receiving yards with 24 touchdowns. He also saw playing time on defense racking up 28 tackles and 3 interceptions. On Thursday, ESPN released updated their ESPN300 rankings. The list is filled with many recruits that already possess Michigan scholarship offers and three of Michigan’s current commits made the list. #167- OLB Devin Bush Jr.
Former Michigan QB commit Messiah deWeaver committed to Michigan State on Tuesday. 2016 OL target Chris Owens committed to Alabama on Tuesday. 2016 LB target Dontavious Jackson announced via Twitter that he will be playing in the 2016 US Army All American Game. 2017 RB target Todd Sibley committed to Ohio State while visiting for their Spring Game on Saturday. 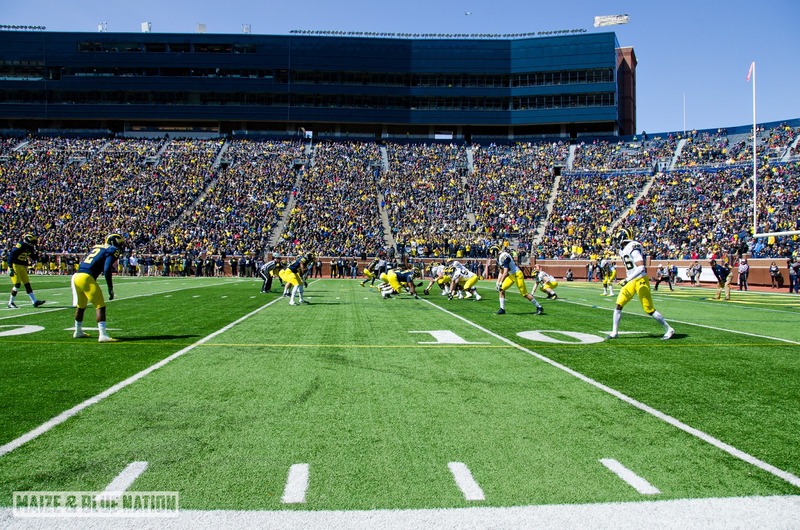 2016 Safety target Devin Gil tweeted that he will be visiting Michigan on June 14th. 2016 OL Alex Akingbulu visited Ann Arbor on Friday for an unofficial visit.